Updated Friday January 25, 2019 by Winkler Minor Ball. 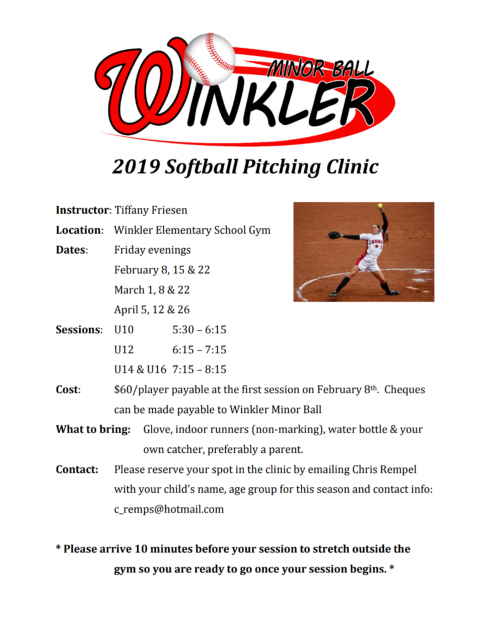 It's starting to feel like ball season with the temperature briefly rising out there but that also means it's time for the Winkler Minor Ball Softball Pitching Clinic to get going soon. Please see the attached poster for all the details! For all U8 girls that will be moving up to U10 this coming season and your daughters are interested in giving pitching a try, this is the best way to get them started on the right path with proper technique. We ask that wherever possible, a parent catch for your daughter as you will be the one spending the most time at home working on pitching. Learning the basics at the sessions will assist you in helping your daughter be successful.